Fox Sparrows are one of our largest sparrows, and in my humble opinion, one of our most beautiful. 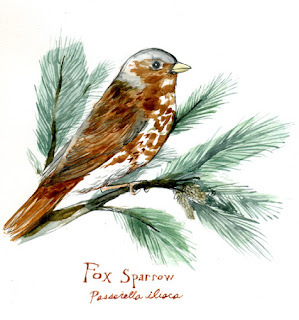 There are four separate populations of Fox Sparrow: Thick-billed(California), Slate-colored (Interior West), Sooty (Pacific), and Red (Taiga). These are sometimes considered separated species. The one I prepared was found by myself in downtown Evanston, IL. It was, of course, a Red(depicted) with beautiful sienna brown streaking on the breast.